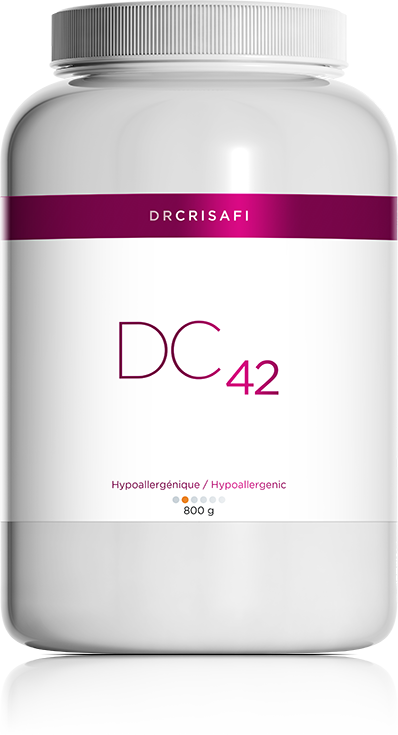 DC42 (Protein and Superfoods). This formula supplies hypoallergenic rice protein along with an alkalinizing and energizing superfood blend. This formula supplies hypoallergenic rice protein along with an alkalinizing and energizing superfood blend. Rice protein is used in this formula because it is highly hypoallergenic. It has been fortified with amino acids in order to make it a complete protein. A number of elements have been included to utilize proteins (N-Zymes, bromelain, ginger root), reduce acidity (spirulina, chlorella), boost immunity (Arabinogalactanes, rose hip, quercetin), improve adaptation to stress (Ashwagandha, licorice, Siberian ginseng, golden root), and improve liver condition (dandelion, milk thistle). Protein supplements and green superfoods.